Update February 16th, 2017 - The NJSIAA's extension for entry closed today February 16th at noon, the revised listing with the new additions noted can be found below. All of the entries from the original closing date date on Monday were protected, this is why entries past the top 24 are listed. Article was originally posted 2/13/2017 and has been updated with the newly released entries. The first entry window the the NJSIAA Meet of Champions Showcase events has passed, here is the preliminary lineup for the 4x800 meter and 200 meter competitions. Anyone in the state in terms of NJSIAA schools were allowed to enter and the top 24 seeds in each race were accepted. This is the first season the NJSIAA will hold the 4x800 meter showcase at the indoor Meet of Champions, the 200 meter was added back into the event lineup in 2015. The top two finishers in last year's boys 200 meter return this season ranked as the sixth and seventh seeds. Thomas Kalieta Jr of Matawan won in 2016 with a time of 22.41, placing him third all-time at the Bennett Complex track, and Martin Booker Jr was second with a run of 22.55. Booker Jr is tied with Kalieta Jr for third all-time at the Bennett Complex thanks to his own 22.41 at the SJTCA #12 meet this season. The top seed heading into the competition this year is Semaj Willis of Trenton Central who ran 21.97 at the Mercer County Championships. Also of note in the boys 200 meter the three of the top five seeds are only sophomores. Second is Luke Colehower of Haddonfield seeded 22.02, third Rahmir Johnson of Bergen Catholic 22.12, and fifth Tyrig Bundy of Deptford 22.37. The girls 200 meter will have a new champion with the graduation of Kiara Lester who had won the event the past two years. Cecelia Gerstenbacher of Delsea is the fastest returner from the 2016 running, she finished second with a 25.17. In 2017 Gerstenbacher is seeded third entering the meet at 25.54. The top seed is Aliyah Taylor of Rancocas Valley who posted a 24.93 at the Ocean Breeze Invitational. The second seed's time came from this very track however, Shakira Dancy of Winslow Twp ran 25.45 at the SJTCA Meet #9 which was held at the Bennett Complex. The 4x800 meter pits some of the best relays in the country against each other. 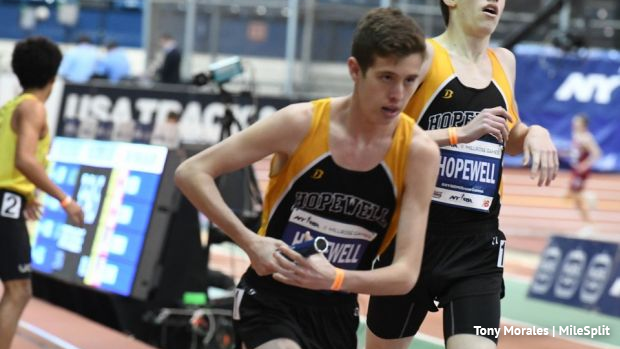 The boys entries are led by Hopewell Valley who just posted a US#2 time of 7:52.76 at the Millrose Games, Morris Hills who is US#3 at 7:53.64 and Union Catholic US#6 at 7:55.28 also come in as potential champions with the only seed times listed under 8 minutes. Again, that is three of the top six 4x800 meter relay teams in the United States going head to head for this showcase. Looking at the girls we have two teams ranked in the top 20 nationally. Top seed is Seneca who ran 9:24.68 at the Morris County Coaches Invitational. They are followed by the Ridge girls who have a 9:28.93 on their resume from the same meet. The new entries from the first posted are marked as bold with a * before their number. The exciting 4x800 meter race from Lavino Relays back in early January featuring top seeded Hopewell Valley who ran 8:05.44 for second against Central Bucks West of Pennsylvania.